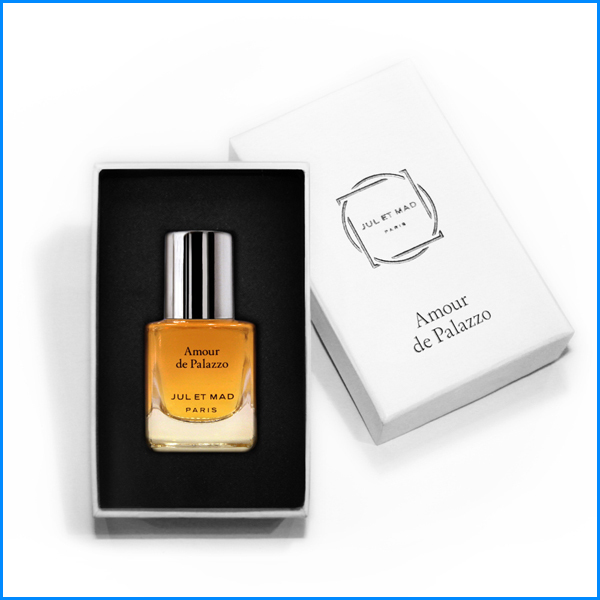 My only complaint about Amour de Palazzo and the brand in general is that it’s only available in one size (50 ml beautiful bottle + 7 ml refillable travel atomizer that is also very nice). Most perfumistas (read – those who will know about the brand and are potential customers) do not need 50 ml of almost any perfume. We will be fine: we’ll do splits. But I think the brand might benefit from selling smaller sizes – even if those will be more expensive per ml than a bigger bottle. I’m happy to report that starting today small 5 ml bottles of all three perfumes by Jul et Mad – Stilettos on Lex, Terrasse à St-Germain and Amour de Palazzo – are available for purchase from the brand’s website. These perfumes come in beautiful small bottles and boxes in Extrait de Parfum concentration. The price of each is 22.50 € / $ 29 (including delivery).